If you ask birders what their favorite holiday is, a few will always smile and reply, “spring migration.” Protracted over several weeks, spring migration can indeed feel like a holiday, or at least an annual ritual: time off from work (to go birding), reconnecting with community (other birders), and seasonal gifts that nature drops off in our yards (in the form of colorful warblers). For beginning birders, mornings in spring can feel as unpredictable as waking up on Christmas as a child to see what Santa brought. Migratory birds appear (or don’t) as if by magic, and the species differ from day to day. There’s no telling what a morning in May can bring. But birds are creatures of habit; with a few tricks, it’s easy to take the guesswork out of birding during spring migration. West and Southwest winds bring us the greatest numbers of migrants, which would ordinarily move straight North from their Mid-Atlantic stopovers. In Westerly winds, warblers sometimes build up against the coast as they try to avoid being blown out over the water. When the wind is from the South, the Berkshires and Pioneer Valley hold more migrants. Doppler radar, mostly used by forecasters use to track weather patterns, also readily picks up signals from migrating birds. Radar works by emitting radio waves that are reflected back to the transmitting antenna by any objects in the way. It’s sensitive enough to detect droplets of water in the air, so it was no shock when ornithologists in the 1950s realized radar could pick up birds as well. Now, advanced birders as well as scientists rely on radar to understand birds’ mass movements at night. There are many ways of accessing radar data online, but the most beginner-friendly is Paul Hurtado’s bird radar website. Just click on the date you want to see radar maps for and you’re good to go! The most important part of reading the radar is distinguishing birds from weather patterns. Rain or hail shows up as denser interference (represented on this map by green and yellow colors) in irregular, ragged shapes. Birds, on the other hand, appear on the map as distinct circles, and show up as lower-density (pictured on this map as blue and light blue). Hard to believe as it may be, most of what the radar is picking up in the image below are birds. Visualization by Paul Hurtado; modified from www.pauljhurtado.com. Why do these birds show up as clusters or circles around radar stations? Radar antennae point their beams up at an angle, creating a funnel-shaped zone of detection. Groups of migrating birds fly relatively low compared to rainclouds and so only pass through a circle-shaped cross-section of radar beams. Think of a cone-shaped searchlight- the lower down in the beam you go, the smaller its area is. So, larger circles don’t mean more birds—they just mean birds flying higher up, where the radar beam is broader. (You can see in the image below that some of the blue circles have started to overlap). But more birds filling the sky will mean that more of the radar beam is reflected, creating a higher-density signal. Dense areas of migrating birds are represented by lighter blues and greens (see Texas and Maine on this map). This is just the tip of the iceberg! There’s much more to learn. In a few days, we’ll follow up with a post on how radar can show birds’ speed and direction, and where they land after a long night migrating. Subscribe to our blog to get part 2 in your inbox! 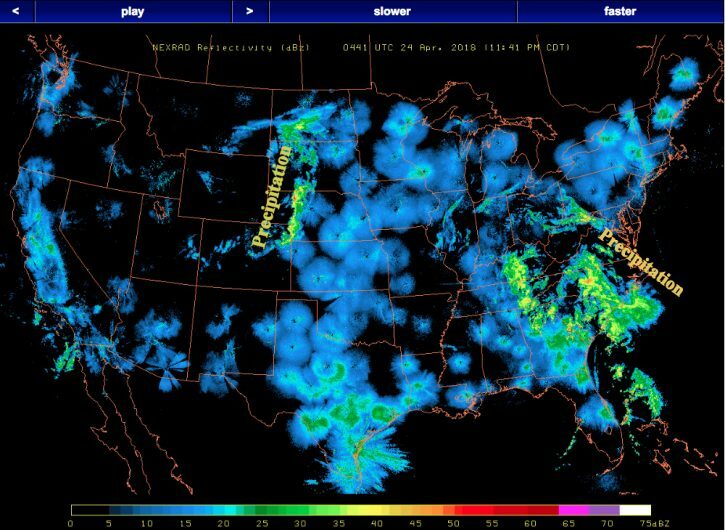 This entry was posted in Birds and Birding, Resources and tagged aeroecology, birding by radar, birds and radar, predicting migration, radar, reading radar, spring migration, tracking birds with radar on April 27, 2018 by William Freedberg.